Most people find what we do fascinating, if not a little overwhelming. As the authors of the leading business book on how to market to boomers and seniors online, we appreciate your need to focus on results over the minutia of what happens behind the scenes. Simply put, we integrate data-driven digital marketing strategy with cutting edge sales techniques to help you win your best mature-market customers at the lowest cost. Our deliverables include qualified leads, appointments and sales. We work with emerging brands that stand to bring value to the lives of our consumers. Key to our success in selling to boomers and seniors is a flexible framework for planning online campaigns that integrates real-world behavioral data with time honored craft of storytelling. From there, we leverage many of the tactics and channels you would expect such as search, social and email. Over the years, we’ve learned what our consumers like and don’t like and we optimize relentlessly on the former. Any marketer worth their salt can increase traffic to your website, improve lead conversion or send email. 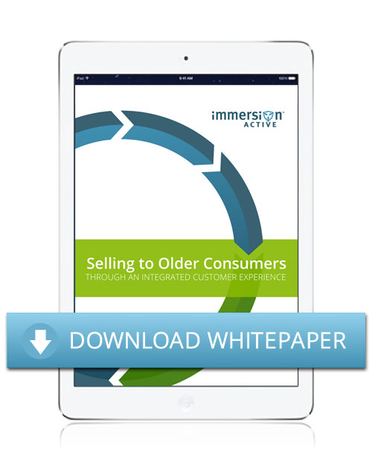 At Immersion Active we stand alone in our ability to move seniors through both the marketing and sales funnels in a highly persuasive and efficient manner. Strategy and consulting services provide customized, digital solutions to help you reach and convert your target boomer and mature market audience. From business analyses and campaign planning to online media/channel mix plans, we work with you to understand and optimize key moments in your customer lifecycle and increase engagement and profitability. Immersion Active specializes in digital advertising campaigns that reach and convert boomer, mature and senior audiences. Our experience with this mature demographic gives your campaign a solid foundation, but then our teams really get to work creating powerful testing, optimization and management strategies to make the most of your advertising investment. Our Email and Marketing Automation team learns how your target audience communicates, then crafts communications strategies and messaging that speak directly to the mature consumer. Our segmentation, analytics and email testing is designed to learn more about the behaviors of your target audience and we use these insights to improve the performance of your communications. Analytics and Optimization services focus on delivering better results by uncovering what’s most important to our client’s bottom line. Every Immersion Active client team includes an Optimization Analyst whose role is to identify opportunities for improvement and create optimization/testing plans that focus on the areas with the highest potential Return On Investment (ROI). Copywriting and Content Development makes audience and customer insights come alive in our communications with the consumer. Immersion Active’s client teams continually evaluate the communications and the channels used based upon user data, analytics and voice of customer insights to keep the communications fresh and engaging. Our award winning Design and Development team are experts at crafting meaningful, emotionally engaging and results-driven online experiences. Creative isn’t just about looking pretty. Our websites, landing pages, emails, video and interactive experiences work together as part of a coherent online ecosystem guiding users towards action that produces results. Integrated sales and marketing services grow the number of qualified leads and sales opportunities. It is the art and science of maintaining the customer’s permission to interact and engage them while they educate themselves through the sales funnel. We pride ourselves on working alongside our clients’ internal marketing teams, and we are often asked to train them on the subtleties of marketing to 50+ audiences. We offer 50+ Marketing Bootcamps, as well as more specific training on areas like copywriting and interaction design for older adults. We can also design custom programs that take a deeper dive into more specific areas.